While many legal disputes are handled in a courtroom, disputes between investors and brokers are typically resolved in another venue: an arbitration forum. It's a declaration you might hear on a TV show, in the movies, or perhaps even in your real life, as one aggrieved party threatens to take legal action against another. But while many disputes are handled in a courtroom, disputes between investors and brokers are typically resolved in another venue: an arbitration forum. When opening brokerage accounts, your investment firm will many times include a pre-dispute arbitration clause in your new account agreement stipulating that any future disputes will be resolved through arbitration. But even if your investment firm doesn't include such a clause, you, as the customer, can still demand arbitration. "FINRA's Dispute Resolution program provides a number of features to ensure the forum is fair to all participants, and affords investors numerous protections," Loyer said. If an investor believes he or she is entitled to damages from a broker, the first step is to file a Statement of Claim with FINRA. 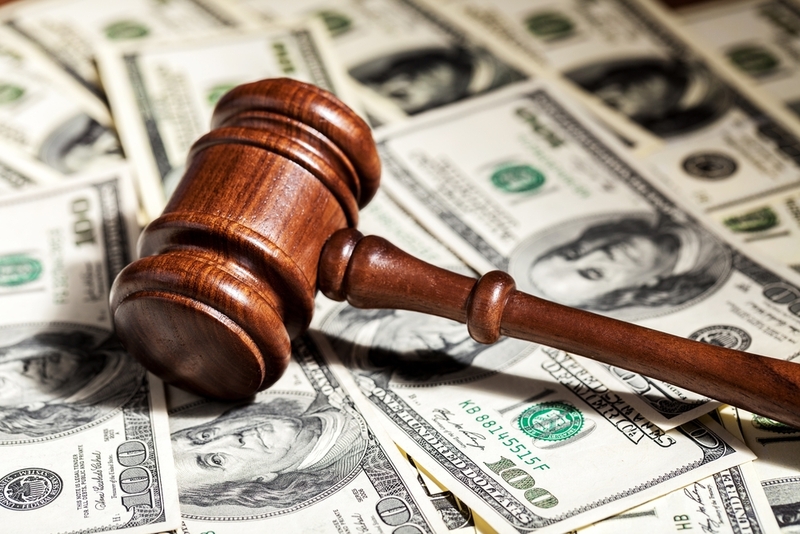 This consists of a written statement in which the investor describes the dispute, specifies the amount of money or other damages sought, and includes any documents that support the claim. In investor cases with one arbitrator, the arbitrator is always selected from FINRA's public arbitrator list, meaning those with no financial industry work experience. In cases with three arbitrators, claimants and respondents are provided with lists of both public and non-public arbitrators, but either party may opt to have an all-public panel. Once arbitrators are selected, a hearing is scheduled and the parties and their attorneys exchange documents and identify witnesses through what's known as a discovery process, which, unlike the discovery that takes place in court, doesn't include depositions, interrogatories and certain other elements, allowing it to take place on a shorter timeline. Claimants may choose to represent themselves instead of working with an attorney but doing so may put a claimant at a disadvantage since respondents are almost always represented by counsel. Investors seeking attorneys can seek referrals from organizations such as the American Bar Association and the Public Investors Arbitration Bar Association. Those who are unable to afford an attorney may be eligible for free legal representation from legal clinics run through several universities. Find more information about finding legal representation for arbitration proceedings here. Filing for arbitration should not be confused with filing an investor complaint. If an individual wishes to notify FINRA of potential fraud by a brokerage firm, he or she may reach out to FINRA's Investor Complaint Center. If an investor is seeking damages from a brokerage firm, he or she should consider arbitration. An investor can decide to both file a complaint and file for arbitration. 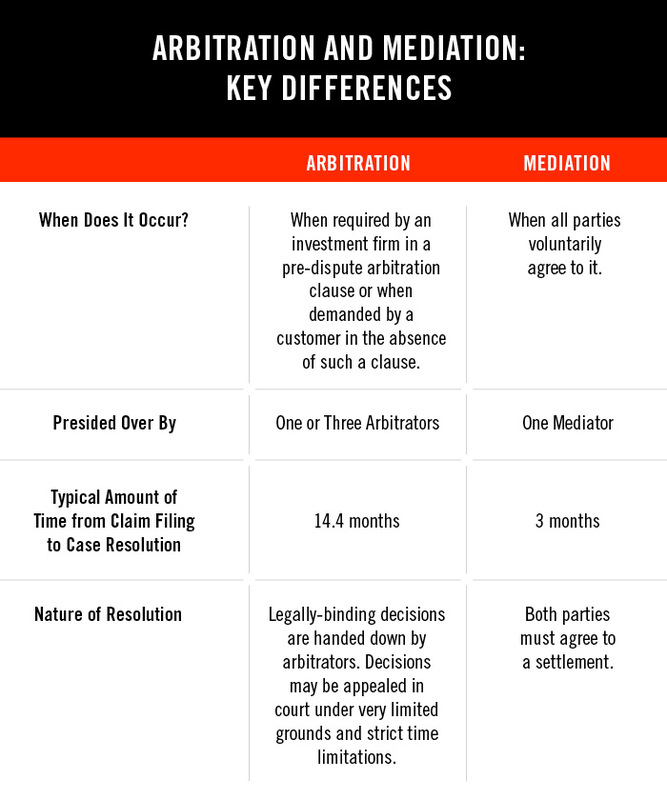 Not all claims submitted for arbitration are necessarily decided by an arbitrator. Parties may attempt to resolve a dispute through mediation. In the first nine months of 2015, there were 378 mediation filings. The parties then select a mediator from a list provided by FINRA, or may agree to use a mediator that is not included on FINRA's list. The costs of the mediation will include the fees charged by the mediator as well as FINRA mediation filing fees. For brokerage customers, mediation filing fees range from nothing to $300, while the fees charged by the mediators themselves will vary depending on the mediator. The parties usually agree on how to split responsibility for the mediator's fees. For small claims of $50,000 or less, the program offers free or low cost mediation (depending on the claim amount). To learn more about arbitration and mediation, visit FINRA's Arbitration and Mediation page.